The TBR 700 Long is available both as an extension kit to your existing TBR 700s or directly when ordering new receivers. Using state of the art digital technology the receiver is compatible with standard code sets and operates at 69 kHz or any other frequency between 63 and 77 kHz. Used in combination with Thelma Biotel transmitters, the receiver supports new and user adaptable code sets to fit your special needs. With a firmware update, it also supports true parallel processing of up to three frequencies simultaneously. Thus effectively tripling the bandwidth of the robust and long range, long lifetime acoustic protocols in this frequency range. This enables up to three times as many tags without more collisions, or the transmit intervals can be reduced to 1/3 without issues with transmit collisions. Equipped with a powerful microprocessor the new receiver makes use of advanced digital signal processing in order to obtain maximum reception and flexibility. Multiplexed reception ensures that weak signals do not interfere with stronger signals, greatly reducing the problem with code collisions. The receiver is logging not only fish ID and possible sensor values, but also the received signal strength. This can be used for estimating the range estimator and is a great tool with range tests and for static reference tags. You do not only get signal absence or presence, but signal quality as well. Background noise, as well as water temperature, is logged at chosen intervals and enables the user to keep track of the receiver’s working conditions during the entire deployment. By monitoring background noise levels, it dynamically adjusts threshold levels to optimize performance under difficult conditions. General updates and tailor-made receiver firmware is easily flashed to the unit by the user, through our ComPort PC software. As the receiver is fully digital, firmware updates do not only contain tag code sets to control tag compatibility, but it can enable inherent functions such as the parallel multi-frequency logging to unleash greater acoustic bandwidth (more tags, more frequent transmits – without more collisions). It also enables a strong potential for further developed with more advanced acoustic protocols for higher data transfer capabilities. Such features are of special value in combination with Thelma Biotel’s sensor transmitters, with or without built-in statistical processing. Data is transferred to a computer using wireless Bluetooth interface. As a backup we have also included a standard USB connector which is accessible as you replace the battery. Interaction with the receiver is intuitive and easy through our own computer software (ComPort). ComPort supports fast download of data, export to .csv, intuitive filtering and graphical display of data. For large data sets of many million detections, ComPort is the market leader by far when it comes to speed of filtering and data export. Human interface with the receiver is user friendly as well, with a three-color diode for easy indication of status (Blue=Bluetooth, Green=listening mode, Red=error). Powered by two Lithium double D-cell batteries this receiver supports continuous deployment of 17-18 months. 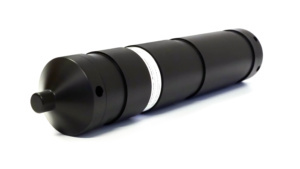 The receiver is a robust unit and suitable for used in lakes, rivers, fjords or even in the ocean down to 500 m depth. Precision milled Delrin© is used in the pressure hull and battery compartment to ensure maximum ruggedness. The casing is fitted with a smart screw mechanism for opening and closing, making it easy and effortless to handle. It can be opened with a standard screwdriver, a coin – or when setting up many receivers for a study, use a cordless drill/screwdriver for increased speed and ease. In order provide the means for a secure attachment during deployment; we have put in three deep grooves and two holes through the bottom casing. All means for fastening is placed in the bottom half of the receiver so batteries can be replaced while the unit is still attached to its fixture.